“Parakram Parv” to commemomorate and show case the gallant valour and sacrifice by the members of the Armed Forces was celebrated with great enthusiasm and gaity in various parts of the North Eastern states. The event was well conceived and plan and display of various equipment of the Armed Forces enthral the visitors, who greatly appreciate the members of the Armed Forces. The event was organised with an aim to reach out to the School students and the civil population in the vicinity of the venue. The event will continue to be open to public at and Students various locations till 29 September 2018. Guwahati : The event was organised simultaneously at Air Force Station, Guwahati and Narangi Military Station. Various types of Weapons and equipments of the Army was on display at the Narangi Military Station. 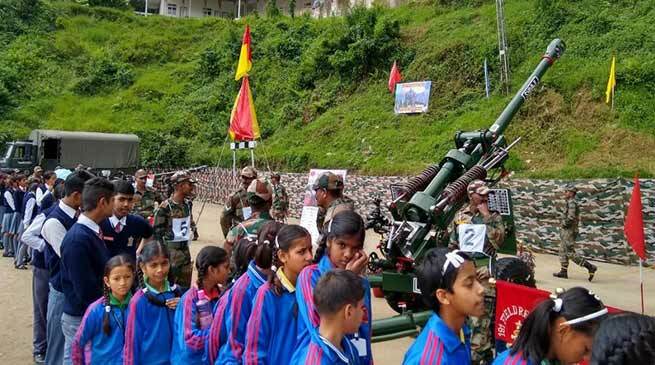 A selfie corner was also established to enable the vistors to take their own selfie.The students from Army Public School, Kendriya Vidhyalaya numbering to around 800 were mesmerised by the various equipment on display and greatly praised the efforts put in by the Army. The Air Force show case their varios equipment to include MI-17 Helicopter, AVRO, Dronier , various Radars employed in the Air Force and Emergency Medical support system. . The event was inaugurated by Air Commodore S Misra, VM, AOC, Air Force Station Guwahati. There were also stalls showcasing the achievement of the Air Force and stall for “Now Your Air Force”where in the visiting students were enlighten on various opportunities for entry into the Air Force. The visitors includes students from the near by Schools, NCC cadets , Students from Aeronautical college and civil populace.The students were briefed on the various equipment and enlighten on various other achievements of the Armed Forces. The representatives from Information and Broadcasting Ministry also display various motivation and knowledge boards to enlighten the student community. The event will remain open till 29 September . Gangtok: Parakram Parv was observed at West Point Senior Secondary School, Gangtok and at Namchi in Sikkim with great fervour . The events include Military Band display, Display of various modern and sophisticated modern Infantry Weapons, Motivation Lecture by the Officers, Screening of movie on Surgical Strikes, Selfie Corner, Information Kiosk and guidance for joining the Indian Army. The event was a great success as more than 2000 students from various schools and the civil populace visited the enchanting event. The Students were of great praise for the wonderful event organised by the Army. The event will continue to be open till 29 September. Tawang: Parakram Parv will be observed at War Memorial Complex at Tawang on 29 September 2018. The various activities planed includes Infantry Weapon Display, selfie Corner Motivational stalls and Screening of Movie on Surgical strikes carried out by the Armed Forces. All the students of various schools in Tawang along with general public are invited for the event. DC & SP of Tawang will also be in attendance. The Ex- Servicemen of the area are also invited for the event to acknowledge their great service to the nation.